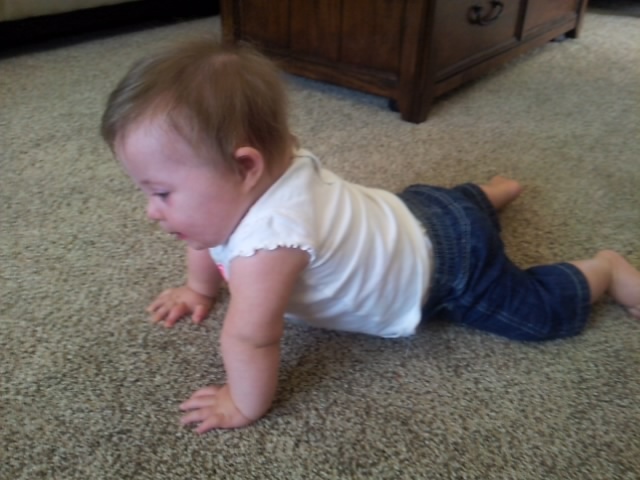 Which may not look like much but what it is, is a LARGE baby step towards crawling. 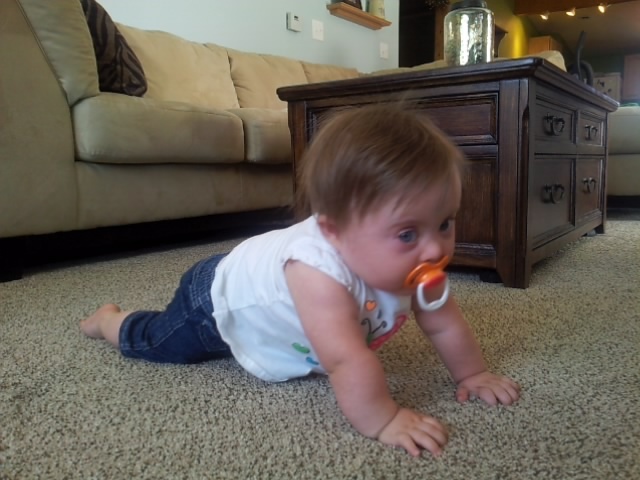 And she’s not stopping there…she is a backwards-scooting, molar-popping, mashed-potato-eating, milestone-meeting machine! Molar-popping? Why yes. Tessa’s first tooth erupted sometime between last night and this morning. She started with a bang…cutting a molar right away…and her two front teeth are next in line. Everybody is right about teething…it’s the worst. The end. Throw the tooth on top of the attempted crawling in a week and this mama is fit to be tied. I couldn’t help but be slightly emotional when I watched her get to her knees or when I saw her tooth while she was screaming and spitting out Tylenol all over herself. These little things are actually great big things that I have been waiting for. Today I realized something. Here goes… Raising Tessa like a “typical” child is far more different than comparing her to a “typical” child. Therefore raising her typically is great, but the comparing stops here. For a while I would catch myself comparing her to babies her age and at certain times finding myself upset about why she wasn’t doing what babies her age “should” be doing, all the while knowing the answer to “why”. 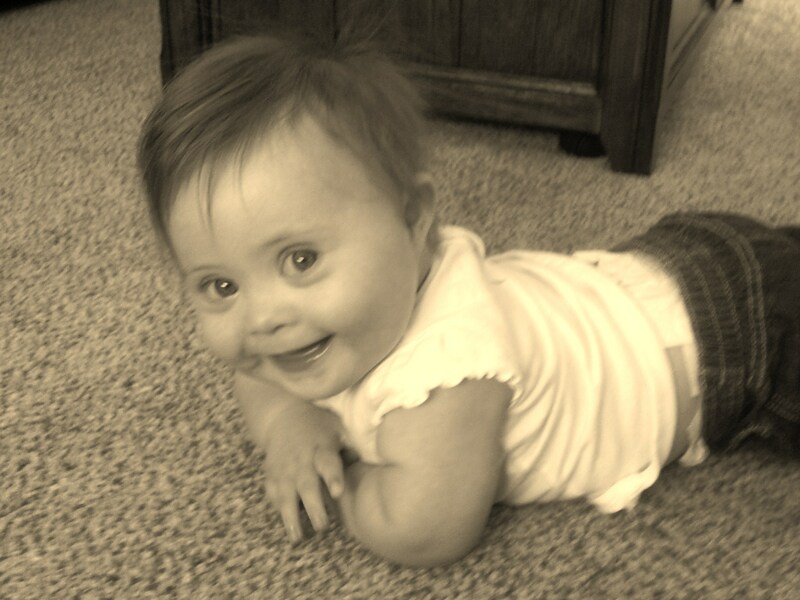 Down syndrome or not, one child can’t be compared to the next. But the fact of the matter is that she does have Down syndrome, and it would be irresponsible of me to constantly compare her to children who are a month older than her or two months younger without Down syndrome. And that was a hard pill to swallow. It is far more rewarding to let her set her own pace and watch her develop than it is for me to try to set a pace for her. All in all, what it all really means is that I get to enjoy Tessa being a baby for just a little bit longer so I am not going to hide behind a candy-coated version of what is real. I have had a few parents tell me that their babies grew up so fast that they forgot to enjoy the first tooth, or the crawling, or the first words. Kudos to Tessa for making me be patient and letting me celebrate all of her little wonders–even if it means I might lose a little sleep or miss a night out. 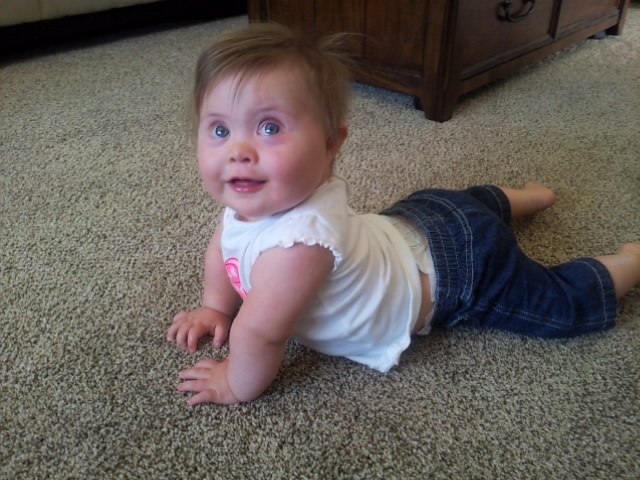 I can relate to so much of what you said- Down Syndrome or not, you and Tessa are absolutely “normal”– trust me! Leyton was 9 months before he crawled. Before he even showed any interest in it. I became so focused on encouraging him to crawl because everyone else’s babies that were his age were, and had been for months, that I didn’t just embrace that special time before babies crawl! And i SO wish i had! And I had such a hard time not comparing him, but the reality is, every baby is different. Some babies just like taking their time, while other babies breeze right through the milestones. So this time, i never compare. I am so relaxed and its so much more fun that way. You have the perfect attitude. And Tessa is seriously amazing. Those that tell you to enjoy this time, they aren’t lying. It all goes too fast!! 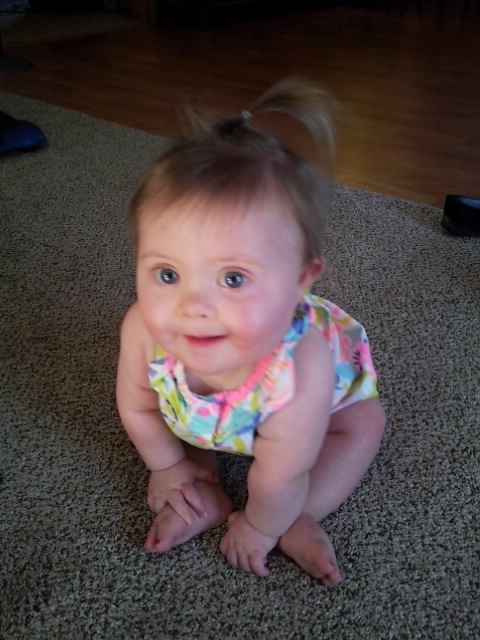 She’s just precious beyond words! !